Posted on August 8, 2012 by Becki M.
It’s been two weeks since I left Facebook. The first few days were hard. Isn’t that sad? But, I’m happy to report that “status update” is no longer part of my mind chatter. This all happened THIS WEEK. Needless to say, I’m riddled with anxiety. It seems like everything is falling at once, and the list of projects is getting longer and longer, while the bank accounts take hit after hit. But here is what is good about not being on Facebook. I would have put those status updates, and that would have been it. Now I’m forced to put it here, and give a real update. The update is this: I am not in control. No amount of stress or anxiety is going to make it better. I need to learn to be content with where I am at and remind myself of our great blessings. We have been blessed beyond measure. While this cheaply built home is driving me insane right now, its a HOME. A fantastic home by some standards. At least we have money to fix our air conditioners in the 115 degree heat; 2 years ago we wouldn’t have. Even if Greg’s car dies, we still have one. Even if all the stuff falls apart and we somehow lose our new home, I will be okay. Devastated, but okay, because I serve a God who is greater than my worries, my pride, my anxiety, and my control. I’m trying to find rest in that. Enough heavy. 🙂 Because I simply cannot wait any longer to share some of our school room, here is a sneak peak at one of the parts! Today I’m working on our calendar for Circle Time, which means I will have the “Days of the Week” song stuck in my head all day. Have a lovely Wednesday! Posted in Homeschooling and tagged homeschool, letter of the week, organization. Bookmark the permalink. OHHH BOY! I feel you in the control area. We are SO not in control are we? For someone like me…cronic worrier and such, it sure does take me a while to just let go. Anywho, I went to go call you this morning, before I read your post and call to chat, and hopefully get together soon. I have so HUGE news and need to pick your brain. Back to trying to call you….when you left facebook it deleted your number from my phone..I guess they were somehow connected! GAH! This is why I NEED and I-phone:-) So email me your number so I can call you!!!! 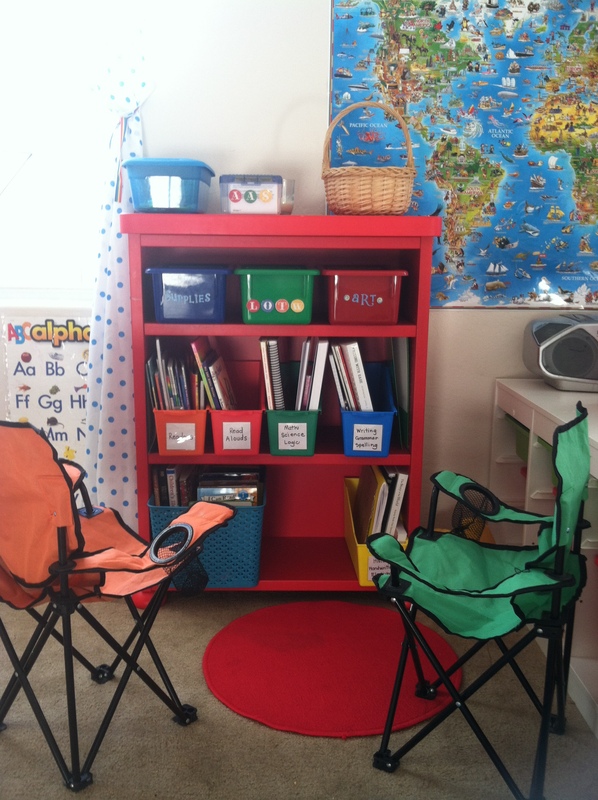 I love seeing other homeschool rooms. I also wanted a beanbag for our classroom and almost fell over when I saw the price! I think I’m going to try and make one. I’m enjoying catching up with you and all your homeschool prepping and planning. I’m getting super excited about starting. The countdown is on for next Monday and I feel like I have so much to do! I’m going to attempt to keep up with my blog, but we will see. Hope you are doing well. I love how you seem to redo your school room every year! So sorry about everything falling apart on you all at once. I know it will end up working out, but it’s no fun in the midst of it all!